The description reads, "CLOG-FREE Glue! This will change your life! :)"
Hmmm. I'm a natural skeptic so I went all "Investigative Report" on this pin and tried it out last summer, so I could report back to you how un-life-changing this is. Because let's face it. Glue is a sticky messy problem that is unsolvable. I will now eat my words. Last summer I decided to try this. I took all my brand-new glue bottles home, took off every single freaking orange cap, and soaked them in vegetable oil. Wiped them down and snapped them back on. This picture may look familiar to you. It's one of my most-pinned images. After the first few uses, I noticed.... nothing. no problems. But that's normal with brand-new glue bottles right? So I gave it a few more months. Nothing. Even when the kids forgot to close the orange caps for days on end, they didn't clump up or dry out! I remember one morning in March when I discovered still-working glue bottles that had been left open over Spring Break and thinking, "what is this black magic???" Then I realized it was the oil. It had actually worked! Not only did the bottles stay clog-free, but I found that we could use almost every last drop of glue in those bottles before replacing them. TOTALLY worth it. We finally used up most of the glue and I had to replace the bottles at each table group last week. Let me stress that these were normal-sized glue bottles, not the large ones. And they lasted from September to half-way through May. Did I soak the new caps? Nope. I was too lazy. And a week later..... CLOG CITY! So I intended to blow the whistle on this ridiculous claim of "CLOG-FREE GLUE" but I will gladly drink the koolaid instead. I'm so glad that you tried this trick and posted the results! I will be using this next year for my glue bottles! Your post cracked me up! 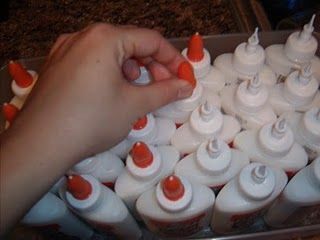 I hate glue bottles, but we need to put them on the supply list because the art teacher uses them. Glad to hear the trick actually works! So excited to have found your blog from I Teach. Your new design is PRECIOUS, and I love the fact that you're crazy about flamingos! 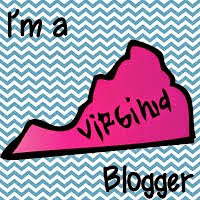 I also teach in VA (Richmond area). Come check out my blog if you ever get a chance! Thanks for the glue bottle solution! I've got it pinned now. What kind of Tupperware do you use in this picture? can you email me at vmpell@hotmail.com? Where did you get the clear table supply caddies? The next time you need new bottles mid year, just switch the caps from the old glue bottles. You won't have to soak the new ones. You could save those and soak them over the summer for the next year's group.